A new office space for seasoned Washington DC journalists. Bloomberg is in the process of upgrading many of its global offices to better accommodate the needs of each workplace and better embody the Bloomberg brand. The challenge for the company’s News & Media office in the nation’s capital was to create a workplace branding system that was “site specific”—in other words, a solution that is the perfect intersection between the overall Bloomberg brand and the specifics of the location—including the architecture of the space, the journalistic activities happening there, and then the backdrop of the city of Washington DC in all its political and monumental glory. 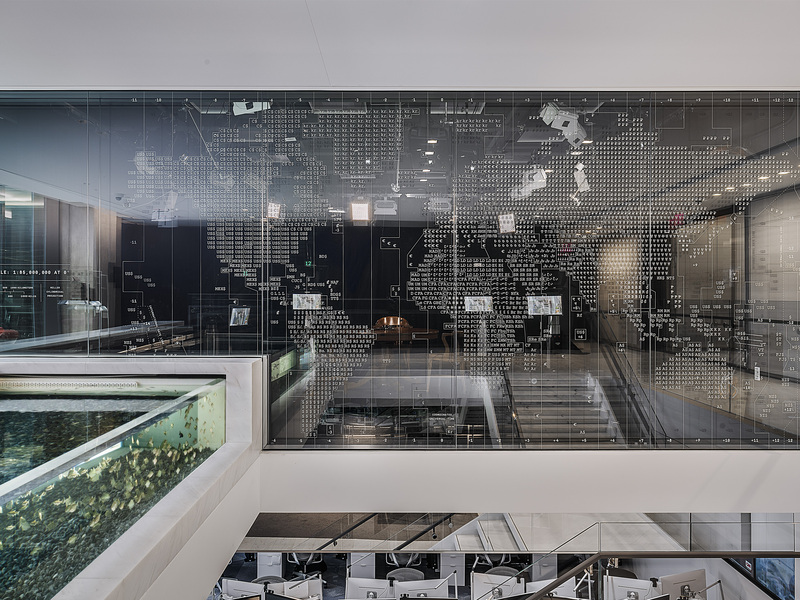 The large mural on the glass above the open stairwell between floors is a visual expression of “Time is Money”—a world map with time zones and each country rendered in its corresponding currency sign. The entire text of the First Amendment to the U.S. Constitution (which includes freedom of the press) is carved into marble circling the entire perimeter of the main floor, creating a symbolic moat that protects all the journalists that work within. The conference rooms are named after government agencies and departments (such as Justice, Labor, Defense or Treasury), the larger meeting rooms named after larger government bodies (such as the Cabinet and United Nations). Each room’s distraction banding is a range of quotes relating to the conference room names, but are constructed as Reed Kellogg sentence diagrams that notate grammar—a nod to the “palette” of words and sentences that journalists use to tell their stories. This graphic motif, when repeated across long stretches of glass and devoid of words, also refers to the speed and exchange of information Bloomberg is so famous for. In each of the elevator thresholds are various Venn diagram interpretations of what Bloomberg does as a company—Journalism-Politics-Finance / Software-Data-Media / Information-People-Ideas / et al. The media walls that greet visitors at the entrance are the dynamic yang to the permanent First Amendment perimeter yin and are programmed with content that is constantly changing—currency rates, stock indices, weather, news headlines, and information about Bloomberg’s history and philanthropy programs.